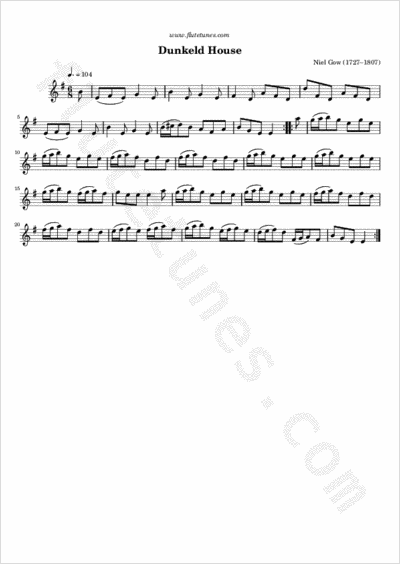 This jig was composed by the famous Scots fiddler-composer Niel Gow around the 1770s for his patron John Murray, the Duke of Atholl. Dunkeld House in Perthshire was one of the latter's seats, lying near to Inver, the birthplace of the great fiddler. In his book Scottish Fiddle Music in the 18th Century (1984), scholar David Johnson wrote that the tune, which has “an unmistakable air of friendship (for Murray) about it”, is still popular in Scotland. It was first published in Gow's First Collection of Niel Gow's Reels (1784).